Just like in other illnesses, burnout symptoms do not just disappear by themselves. burnout is namely caused by poor habits. WIth poor habits, we mean habits which do not work stress-reducing. If you, for example, are a perfectionist, it does not always help to triple check your work if you have a lot to do. In the beginning this might be experienced as stress reducing, but after a while you will have so much work to do that this technique no longer helps you. In this, a treatment of burnout can therefore be useful. A treatment of burnout focuses mainly on reducing stress and the learning of new habits, which can make it so that you develop ways to reduce stress. A treatment of burnout therefore has the goal of treating your current burnout and to help you create new habits to prevent burnout in the future. The different stages in a treatment of burnout? In the first stage of a treatment of burnout you are to be given more information about burnout, so that you can recognized your symptoms early on and get to know your current situation in a better way. Despite that you, for example, have gotten a diagnosis of burnout, you will oftentimes still have many questions. This phase answers these questions and gives you more information regarding the mechanism of burnout. The first phase of a treatment of burnout thus has the goal of helping you get to know and understand your current situation. The first stage of a treatment of burnout thereby helps you to understand yourself and your current situation in a better way. In the second phase of a treatment of burnout, the problem is actively worked on and a solution is worked toward. This means that you and your care provider will look at when you experience less stress, in order to then use this knowledge to let your general stress level go down. Many therapies choose to help you focus on what you are already able to do in order to change your habits, to cause a long-term stress reduction. In this phase of the treatment of burnout, you can slowly but surely get back to doing things, becoming more active. It is important to only do this after having gained some new insights. Otherwise, chances are that you will push yourself too far once again. In the final phase of a treatment of burnout, you actively implement the new habits which you have learned, in order to slowly but surely start to undertake activities in a more intensive way again. Here, it is important to be guided step by step, so that your chances of relapsing are kept at a minimum. Where can I go for a treatment of burnout? The treatment of burnout above can be found at a psychologist, psychotherapist, or an online self-help program A psychologist and a psychotherapist guide you face to face to reduce stress and burnout in the future. Except for the traditional types of a treatment of burnout, there now also are new types of treatment of burnout. In order to shorten waiting lists or to reduce the size of the first step toward help, there now are several online programs, which can help you in dealing with your mental issues. “15Minutes4Me.com” developed such an online self-help program, inspired by cognitive and systematic solution focused techniques, to guide you in the treatment of your burnout. The program was inspired by existing therapeutic techniques which offer you treatment of burnout from home. 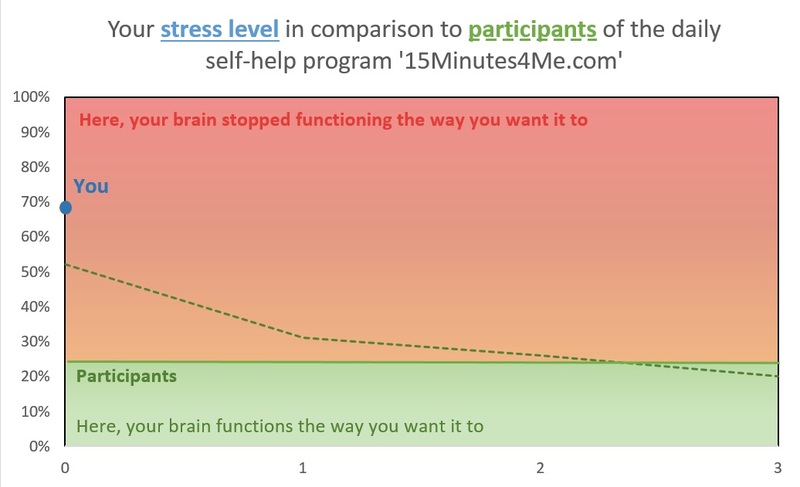 Research has shown that the average participant of “15Minutes4Me.com” experiences a reduction in stress levels by about 77% after one month of using the program. Just like in face-to-face therapy, “15Minutes4Me.com” helps you to gain understanding and insight into your situation and to step by step integrate new habits into your life. Use of medication in treatment of burnout? In general, medication is not used in the treatment of burnout. What can be prescribed eventually would be sleeping pills, in order to reduce a symptom of burnout, namely sleeping issues, in the short-term. Test your burnout symptoms at the hand of the burnout test! Would you like to know to what extent your symptoms of burnout influence your life and what type of treatment of burnout can help you with this? THen take our free online burnout test here!